The Letter: A few weeks after her father's death, Tommie McCloud receives a letter in the post from a stranger. The woman claims that Tommie is her biological daughter, kidnapped from her as a baby over thirty years ago. The Lies: Tommie is approached by journalist Jack Smith, who claims to know about her past. But is he really who he says he is? The Truth: Not sure who to trust or what to believe, Tommie sets out to discover the truth about her identity and in doing so uncovers explosive secrets that threaten not only her life, but also the lives of those she holds dear. Debutant Heaberlin brings her award-winning journalism skills to bear in this intriguing mystery about a prodigal daughter returning home to rural Texas for her father's funeral, only to have all her beliefs about her family shattered. Heaberlin shows plenty of promise as a crime writer, and there was a lot I really liked, but PLAYING DEAD is a little bit of a mixed bag out of the gate. A few wee things prevent it being a five-star debut, while at the same time there are strong signs Heaberlin has serious storytelling skill. A former rodeo rider and now child counselor, Tommie has returned 'home' to mourn her father, only to receive a letter from someone claiming Tommie was kidnapped from her real Mom as a child. Is this a cruel hoax, the ravings of a nutter, or is everything Tommie knew about her family life a lie? Unable to let it go, Tommie embarks on a dangerous rollercoaster of discovery as she digs into her own past - as well as the mystery of why this is being brought to light now, and why. Heaberlin has a great knack for pithy, memorable description, and she brings the rural Texas setting to vivid life. Not just in terms of the place, but the people who inhabit it. Geography and sociology. Packed with memorable, at-times larger-than-life characters. Occasionally I felt some aspects, particularly in relation to Tommie's choices and actions, rang a little false or forced - 'would she really do that?' kind of stuff. So there was a slight disconnect now and then where I wasn't fully caught up in the suspension of disbelief (where we just ride along with whatever an author unveils). 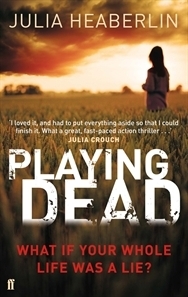 But overall I found PLAYING DEAD to be a good read about family secrets and what makes us who we really are. I look forward to more from Julia Heaberlin, a debutant with real talent and promise. Craig Sisterson is a legal journalist who also interviews authors and writes about crime fiction for several magazines and newspapers. He is the founder of the Ngaio Marsh Award for Best Crime Novel.